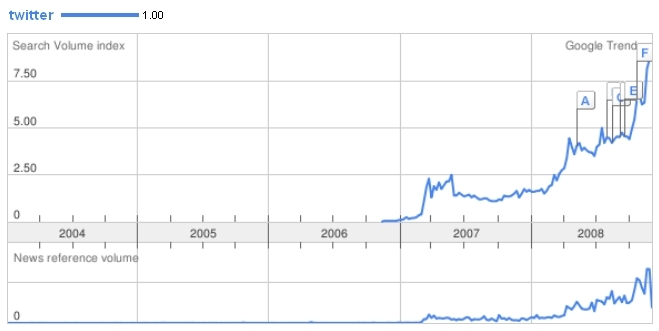 This graph shows the huge increase in searches for the word “Twitter” on Google. It could be said to roughly correspond to the service’s popularity and importance. Or maybe, for some of the non-adopters, it signals their rising levels of scepticism and annoyance in constantly hearing about it. After some heavy field testing, I have discovered that Twitter is not exclusively for smug fools. Actually I have even stopped coyly referring to an update as a “Twitter post” and just started saying “tweet” like everyone else. Indeed. Yes you ARE justified in feeling a little online service sign-up fatigue, but this is not another Facebook. The tweet hype will increase well into 2009, so you may as well try it. At least to avoid that kind of feeling of being the only person not on pills at a student disco. Here’s a decent Twitter tutorial and here’s a persuasive intro to Twitter by Tim O’Reilly, the tech publishing overlord. Such a medium gives tiny glimpses into the everyday. So if you were ever to meet Tim O’Reilly you could ask him about, say, his horses. That kind of question is officially not weird anymore – should it be that you find yourself stuck for an opener, meekly cowering beneath his guru beard. The existence of a communication platform based on 140-character messages shouldn’t be shocking. Text messages have been widespread for about a decade. Yet, even among tech people, some of the admittedly valid criticism of Twitter points to this issue of brevity. Other than being the soul of wit and all that, this is a definite limitation. But every medium has features which can manifest as weaknesses. Nobody’s suggesting this should be the optimum or dominant form of communication between you and me. It can just augment and support what already exists and fill a niche of its own, just as conventional text messaging has done. Besides, a big part of the appeal are web links which telescope off into bigger “messages”. As you read people’s tweets over time, you build up impressions. Twitter is months of agonising smalltalk, crushed down to the basic eigenvectors. So I am intrigued by the pure economy of Twitter communication. It reminded me of other things – its precursors, especially other technologies. That’s it – low fat communication with no caps, no punctuation, no salutation, no sign-off. A mere two letters and with that the most commonly recognised word in the English language. My brother gets them too and it’s become a small point of reference in conversation between the two of us. It’s one of those trivial but cherished things that families have in common. The fact is, because of the context and who it is, these replies from my dad always mean a lot to me. The “ok” signifies several things… I am here / I agree / No problem. It’s usually in reply to a plan or proposal from me, for example an initial text to the parents saying “hi, see you sunday, will pop round” so it’s about optimism and expectation too. It also reminds me of the ultimate succinct exchange, when the author Victor Hugo was relaxing on holiday and used the high speed technology of the day, a telegram, to send his London publisher a single question mark. Keen to get news concerning sales of his new book Les Miserables, he received an equally terse reply. The first print run had entirely sold out and the publisher’s telegram was a single exclamation mark. We can speculate why this took place. My theory is that the author was just too exhausted to embellish the message after the long process of getting the book finished. Did the book REALLY sell out on the first run? Or is that fact included just to spruce up the anecdote (which I first read as a boy in Reader’s Digest)? How would Victor have reacted to the West End’s frilly-costumed musical adaptation? We need not concern ourselves with these uncertainties. What we do know is, the messages are only rendered meaningful by the “metadata” of CONTEXT, with just enough content to work. See also: the Laconians, who stripped away all the redundancy to deliver pointed, concise, laconic comebacks. Perhaps tellingly, the second biggest adopters of Twitter have been the Japanese, where wired openness about daily life gives rise to thousands of digital haikus per second. We should also note that English and Japanese are currently the only interface language options on the Twitter website, although client software in different languages is available. I’ll reserve that line of enquiry for a future post. The upshot of these examples is: we’ve long known that you can squeeze a lot of feeling or intent into a message with tiny informational content, from a round of applause to a marine distress signal. So the brevity is fine. But what about Twitter as an echo chamber of self-referential tweets and inane signalling about Twitter itself? “Hello world.”, “I’m tweeting.”, “Which client do you favour?”, “test123” and so on? Well, the channel is open, and I think this is all possibly fine too. Socially, amateur radio was always a marginal hobby and I guess it still exists in some corners. My awareness is largely informed by the Tony Hancock sitcom episode, The Radio Ham (although I believe enthusiasts hate this term). In reality, I’m told that much of the chatter on the airwaves was to exchange callsigns, establish contact and discuss – wait for it – the newest equipment for doing amateur radio. Young boy riding by at high speed on a bicycle shouting repeatedly, ‘I am here.’ Perhaps the central and single message of humanity. The last time I did a precise measurement of a message’s informational mass, I was studying a module on coding theory. We learnt how to introduce redundancy deliberately, to assist error-checking when sending data signals. It was useful but a bit on the dry side. I much prefer the riffing from people-to-people – and the joy of a communication which even, at times, celebrates itself.